The plant family Begoniaceae is a large family of over 1,000 species of begonias. It also includes at least 10,000 cultivated varieties. Identifying begonia's solely by their leaves can be a tricky process, but in combination with identifying the root system and growing conditions you can narrow your search. The good news is that because the leaves can be so diverse in appearance, you may be able to match them to photos in a plant identification guide. Begonia leaves can come in a variety of intriguing colors and patterns. The wax begonia is aptly named for its waxy leaves. Wax begonia leaves can be bronze, red or green, but they always grow in an alternate pattern. They are also broad and serrated (also called toothed) on the margins. Angel wing begonias on the other hand have long leaves shaped like cones and have fine hairs on their margins. The beef-steak begonia has many leaf colors that can be identified by the hairs on the leaves and the succulent nature of the stem. 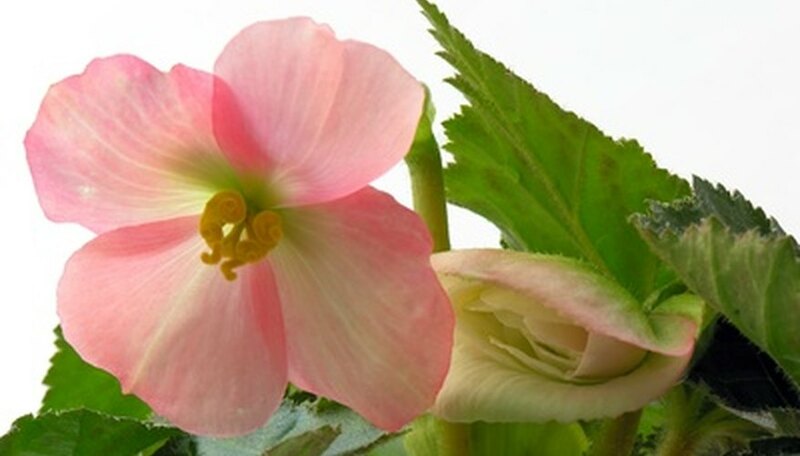 Rex begonias are more often grown for their foliage rather than their flowers, which can be hidden by the large leaves. Rex leaves have intriguing colors and patterns on them. Begonias can be either fibrous rooted, rhizomateous or tuberous rooted. The beef steak begonia is an example of a rhizomateous root system. Rhizomateous roots grow horizontally underground, producing stems and roots from nodes. If your plant has both a rhizomateous root system, a succulent-like stem and hairy leaves, you likely have a beef steak begonia. Fibrous-rooted begonias include the popular wax begonia. Combined with their waxy leaves you can use the fibrous nature of the root system to identify your plant. Tuberous-rooted begonias are identified by their tubers, which grow underground and store food and energy for the plant. A popular variety is begonia tuberhybridia, which has serrated leaf margins. Begonias prefer shady, moist and humid growing conditions. They are best grown outdoors in southeastern states, such as Florida. However, hybridization has also produced cultivars that can be grown in more temperate climates. Begonias are often also grown indoors, year round. As a part of your identification process note the growing conditions of your unknown plant. Coupled with identification of the root system and the color and pattern on the leaves you may be able to determine that your plant is likely a begonia, even if you do not yet know the specific species. Much like the leaves, begonia flowers come in wide variety of growing habits and colors. Flowers can be single or double, grow on tall stalks or close to the foliage. In some cases, such as with many Rex begonias, the leaves may in fact hide many of the flowers. Colors of flowers can range from white to pink to red to yellow. However, combining leaf characteristics with flower colors and shape will help you identify your specific species of begonia. Mostly likely you will need to compare the leaf of your begonia to a photo in an identification book. Both "Begonias: Cultivation, Identification and Natural History" by Mark Tebbitt and "Begonias" by Mike Stevens are good identification books.